Aiseesoft iPhone Software Pack for Mac is the best discount iPhone software for Mac users. 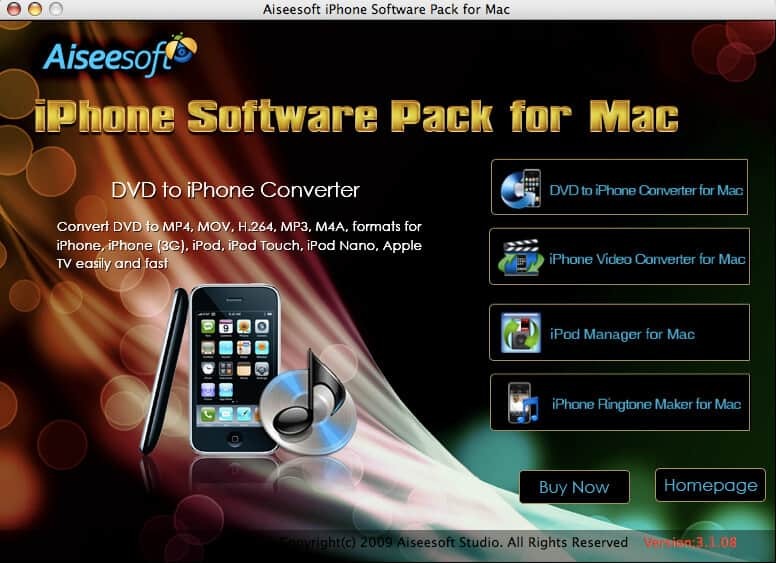 It packs four excellent Mac iPhone software: Aiseesoft DVD to iPhone software Mac, Aiseesoft iPhone Video software for Mac, Aiseesoft iPod Manager for Mac, Aiseesoft iPhone Ringtone Maker for Mac. Using Aiseesoft iPhone Software Pack for Mac, you can convert any video/DVD to iPhone Mac, backup the audio, video files on iPod to Mac and import audio, video files or folders from Mac to your iPod without iTunes with the help of iPod Manager Mac, even make iPhone ringtone from AVI, MPEG, WMV, MP4, FLV, MKV, H.264/MPEG-4, DivX, XviD, MOV, RM, RMVB, MP3, WMA, AAC video and audio sources on Mac. Key Functions 1.Convert video/DVD to iPhone software Mac Aiseesoft iPhone Software Pack for Mac can convert any DVD/video/audio to iPhone/iPhone (3G) MP4, H.264, as well as the MP3, AAC, WAV, M4A audio on Mac. 2.Transfer files from Mac to iPod, iPod to Mac Backup iPod files to iPod directly, import files or folder from Mac to iPhone, with the help of iPod Manager for Mac. 3.Make any time length iPhone ringtone by iPhone Ringtone Maker for Mac Assist you to make ringtone for your iPhone, iPhone OS 3.0/3.1 from your own video and audio sources in any time length by specifying the start time and end time or dragging the slide bar, you also can edit the added iPhone ringtones.